Brooke and I have been a little stressed about finances lately. There are some things that really need to be done in and to the house, and we’re not in a position to do all of them at once. Suffice it to say that when the basement rec room started flooding during a recent storm, we were not pleased. Brooke made me call my father to thank him for giving me a wet/dry vacuum for my birthday some number of years ago. Saturday, it rained again. This time, Brooke went down during the storm to determine if she could identify the location of the leak. This had previously been very difficult, as we hadn’t seen the flooding until after the rain stopped, and there’s fake wood paneling on the walls. But on Saturday, Brooke found this. I was still in my PJs, but I threw on a rain jacket and went outside to bail out the window well. There was water pouring out of the gutter, splashing directly into the window well. Thunder crashed, the rain continued, and I went into the garage to find something to deflect the water. The first thing I saw was going to work: a storm window. 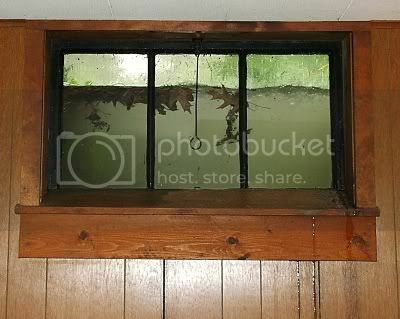 Since it’s July and I live in North America, the storm windows were just hanging around the garage, waiting to be used. I leaned it over the window well, and the water stopped gushing in. When the rain and lightning cleared, Brooke went out to clean out the gutter. However, it wasn’t clogged—there was a loose nail that made the gutter sag. She pounded it back in, and the problem seems to have been tempered for now, although there’s still a slight drip just a foot or so away from the window well. The leaking seems to have stopped, and that’s the important thing for now. That picture makes me claustrophobic. Here's hoping for more sunny days. wow - freaky. Glad that worked for a temporary fix. If you can, get a galvanized screw and some caulking. screw through the gutter into a NEW spot (the current spot is weakened now) and then caulk over the screw and the old hole, too. We had a leak in our basement window and the landlord gave us a pump and we've never had a problem since. The pump sits idle near the window and when it rains we turn it on. There's a hose that dumps the water out about 8 feet from the window. When Vero and I bought our house I was shocked and amazed by the vigilance with which it must be protected!